Often we hear of lottery winners doing something good, like giving to charity. 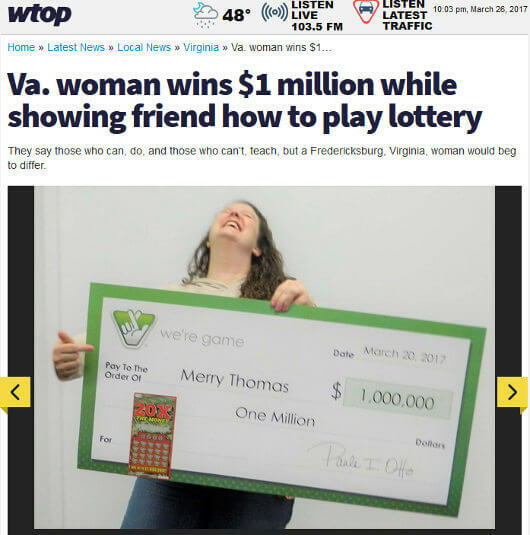 This time a Fredericksburg, Virginia woman won the lottery as she was doing a friend a favor. When Merry Thomas finished an overnight shift Monday morning, she and a colleague set off to buy lottery tickets. Only difference between the two was that Thomas knew how to play, and her friend is still relatively new. So Thomas showed her friend how to use the ticket machine and how to check if she had won. Both of them bought tickets for the Virginia Lottery’s 20x the Money game. She must be a good teacher because her friend won $12 . But when she scanned her own tickets, she was floored when it returned a million dollar winner. Her friend described Thomas as having turned into a puddle the moment she realized she had won. She opted to receive the prize in a single pre-tax payment of $630,915 instead of the full amount over 30 years. The Giant at 35 Town and Country Road, in Fredericksburg received $10,000 for selling the winning ticket.